Looks like my crafting break is well and truly over now - I've been non-stop crocheting for the last week all to try and have gifts ready in time for family Birthdays. I'm pretty proud of myself though with these two little cuties. 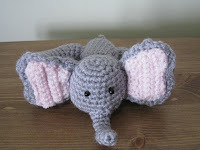 On your right I would like to introduce the little elephant that I made up for my second little niece's Birthday (too many Birthdays!). 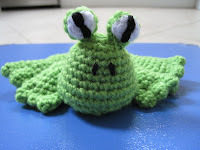 This little one was also very easy to make (though when making the ears I really couldn't see how they would end up looking anything like elephant ears... but it all worked out in the end).